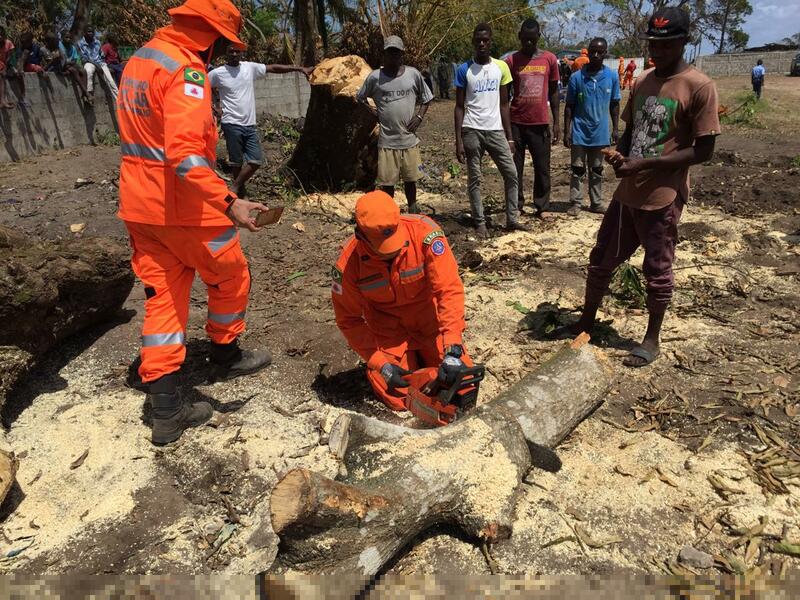 On 14 March, the city of Beira in central Mozambique’s Sofala province was devastated by Cyclone Idai. According to the UN over 1.85 million Mozambicans have been affected with some 240,000 homes destroyed and more than 160,000 men, women and children left living in temporary displacement sites. This powerful storm destroyed over 700,000 hectares of vital crop land in central Mozambique, the country’s breadbasket accounting for 13% of all arable land. A new remote rapid assessment carried out by the World Bank estimates that damages will run to more than USD 770 million. In addition to the initial emergency needs on the ground, central Mozambique faces a long road to recovery for agriculture, infrastructure, housing and restoration of livelihoods. 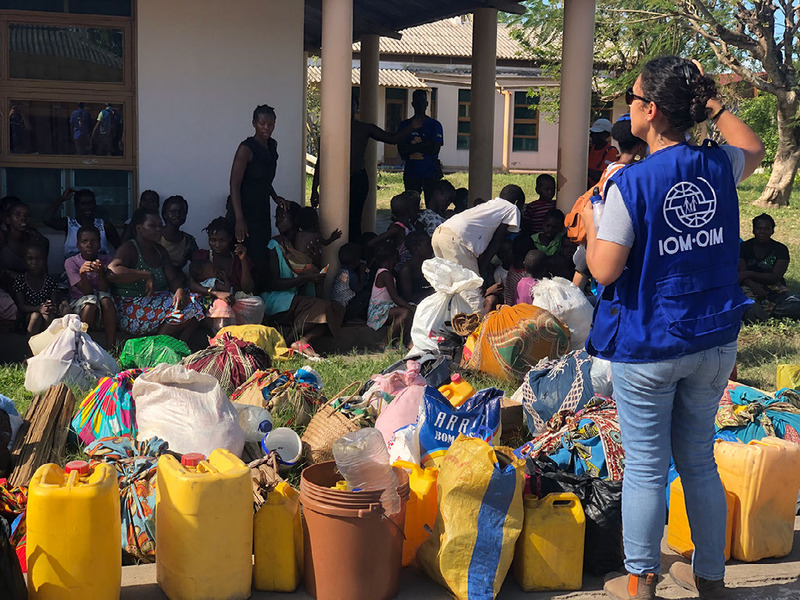 In response, the International Organization for Migration (IOM)—in support of the Government of Mozambique—is deploying experts from around the world in an effort to support affected populations. 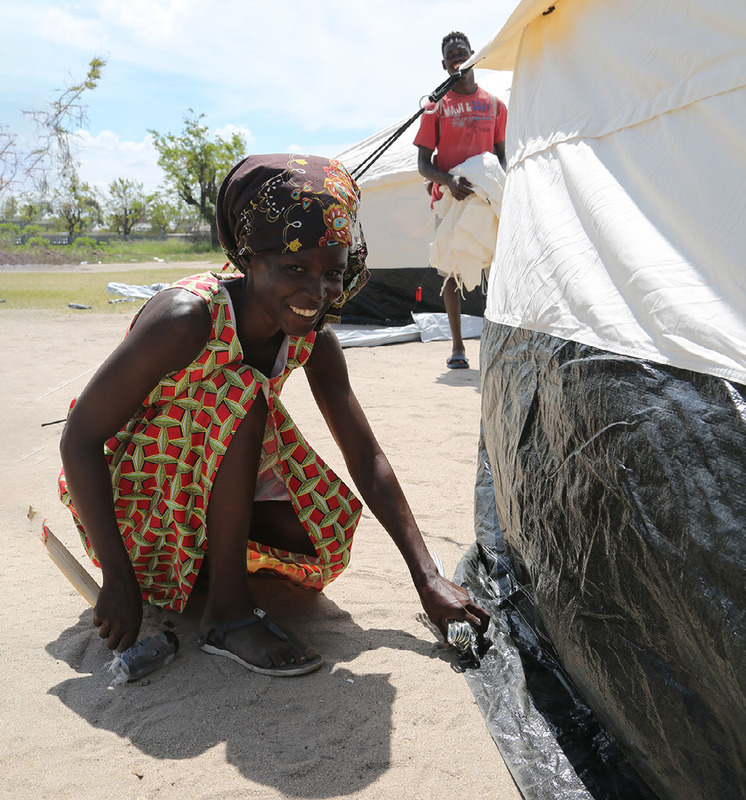 Affected families in Beira, Mozambique, construct new shelters and attempt to fix their roofs. IOM/Sandra Black 2019. An estimated 175,000 families from across the region are struggling to meet their basic daily needs for food, clean water and shelter. Nearly one month since the cyclone made landfall, displaced families are living in over 160 temporary displacement sites including schools and clinics as they have no homes to return to and flood waters remain high in many areas of Sofala, Tete, Manica and Zambezia. However, the aftermath has seen neighbors and communities from around the world demonstrating their support. 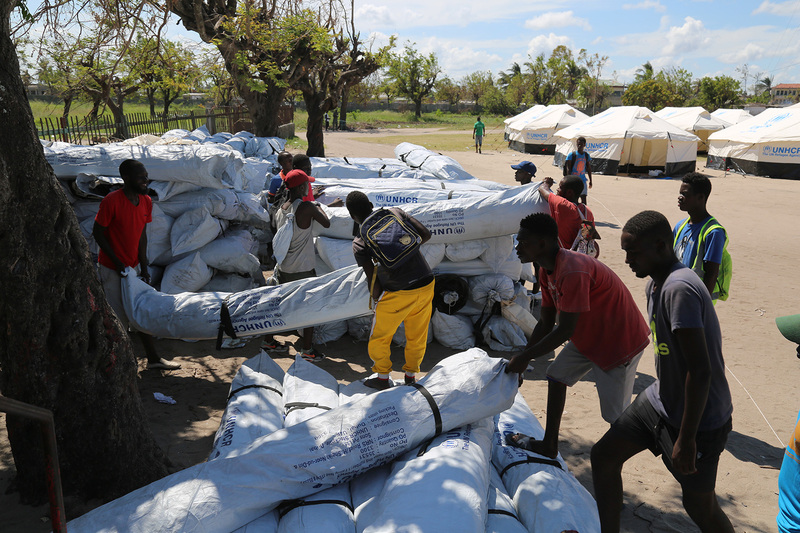 The Government of Mozambique’s National Institute for Disaster Management (INGC) and the wider humanitarian community are urgently seeking additional shelter materials to support the needs of displaced families currently sheltering in schools, and to reclaim space for students to return to their studies. 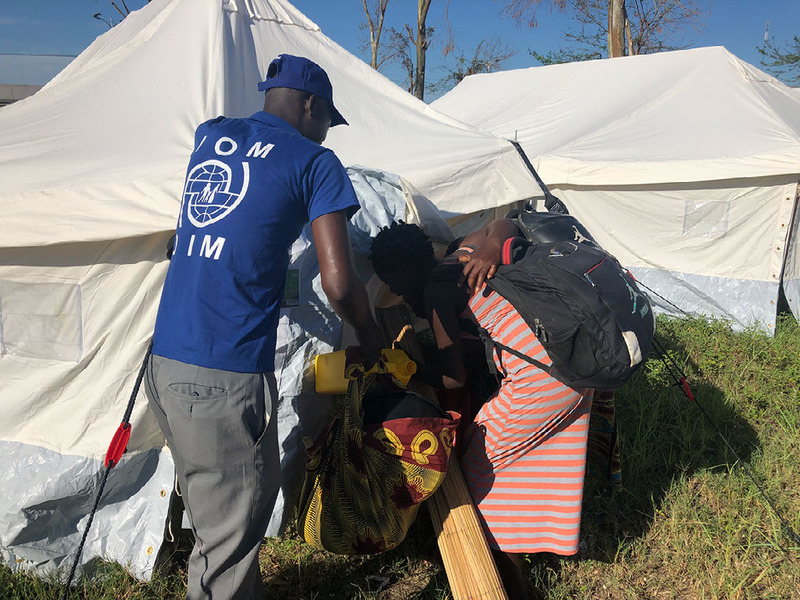 IOM is working in close collaboration with Government and Cluster partners to establish five new consolidated temporary displacement sites in the Beira area that are well-prepared and designed to meet the needs of over 3,500 affected Mozambicans. Hundreds of locals, despite their own hardship, have sheltered neighbors and family members, and are assisting the displaced. 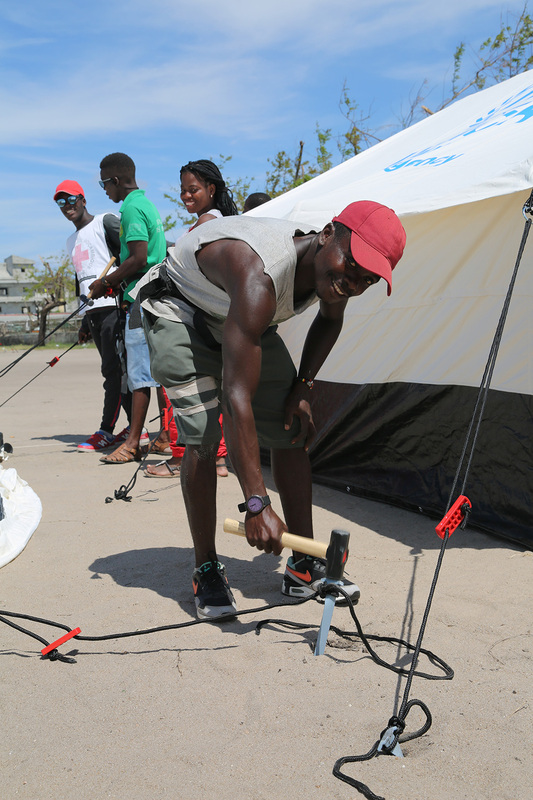 Groups of youth volunteers are dedicating time to assisting persons in need by setting up tents for displaced families in Beira. IOM engaged more than 30 youth volunteers to help set up over 80 tents provided by UNHCR and the Turkish Red Crescent. This effort took place in early April at the Escola Samora Machel temporary displacement site, established by the INGC. IOM’s shelter staff provided guidance and oversaw the process. 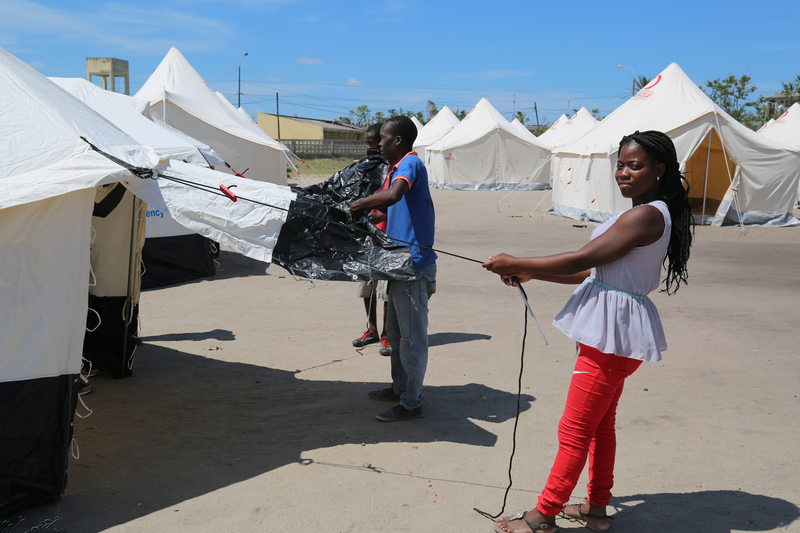 Youth volunteers set up tents at Escola Samora Machel displacement site. 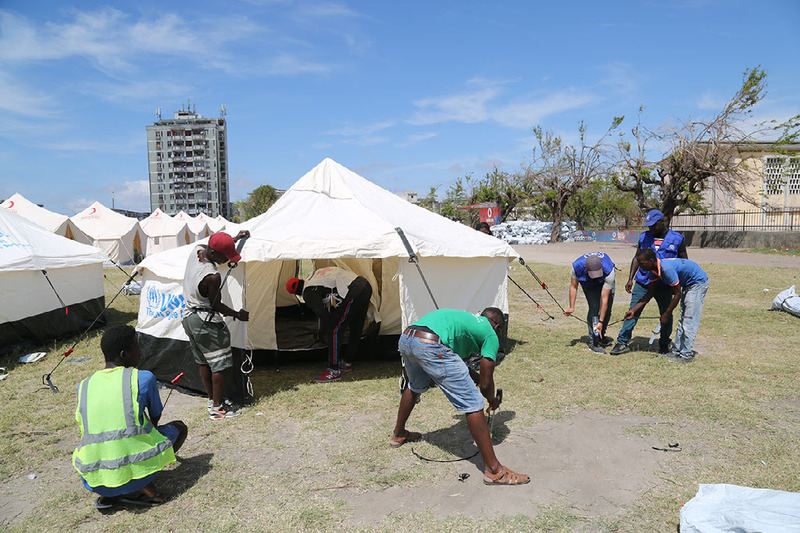 More than 70 youth volunteers have also been involved in setting up other displacement sites in Beira. Many of the youths, who were also deeply affected by the cyclone, and realize the importance of their assistance. Adults shared frightening stories of the destruction they witnessed in their neighborhoods. "During the cyclone my house fell to the ground – to knee height. It was crushed by three big mangrove trees. We ran to my grandfather’s house, but then his roof blew off,” said Querimo Matus, who is 35 years old, and has five children. “Now we are staying in my uncle's house. His house still had walls, we put the roof back on. There are 10 people in the house, five of whom are children, we are all in two rooms." Pekina Felix Tomé, 32 years old, is a widow from Beira, Mozambique. Her daughter is nine years old. 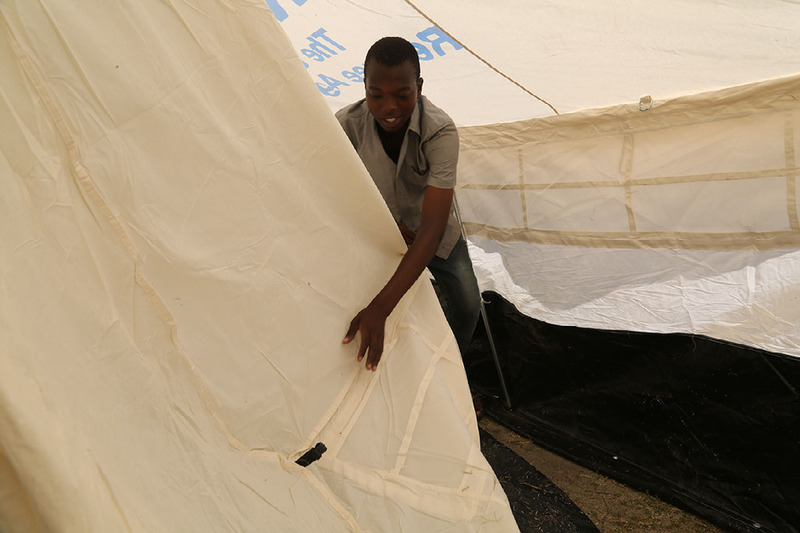 “I am glad to be part of this effort to set up tents for displaced families. I learned a lot. We all suffered. It is important that we come through this crisis together.” Photos: IOM/Sandra Black 2019. “During the cyclone my daughter and I were home alone. The sound was very loud, many trees were falling. We were very scared. The roof completely blew off our house on the first day of the cyclone. We ran to our neighbor’s house and stayed on their veranda until morning. The rain continued for several days and soaked everything in the house. We were without food during the cyclone because all of our food was totally wet. “Many houses in our area were damaged; a coconut tree fell on my neighbor’s house. We could not go to my mother’s house because she lives far away, and her house was damaged also. My daughter developed a bit of a fever during the cyclone, but she is okay. “We found the metal pieces for our roof and put them back together, but it is not like before. It leaks and water comes through the holes when it rains. Some of the neighbors helped, but everyone had to work on their own house too. I purchased plastic to cover our roof, but it was damaged in the wind and how has holes. If I had the means I would make a new roof, and we would continue to live a normal life. "This work is very important. It is very good to help our brothers who suffered and who mourn, " said youth volunteers. Photos: IOM/Sandra Black 2019. “The population still needs support," said Cassam Coliman, 23 years old from Beira. “It’s very good gesture to our fellow human beings to provide humanitarian assistance.” A coconut tree fell on Cassam’s house during the cyclone, but none of the five people inside were injured. The establishment of the temporary displacement site at Escola Samora Michel was a collaborative effort. 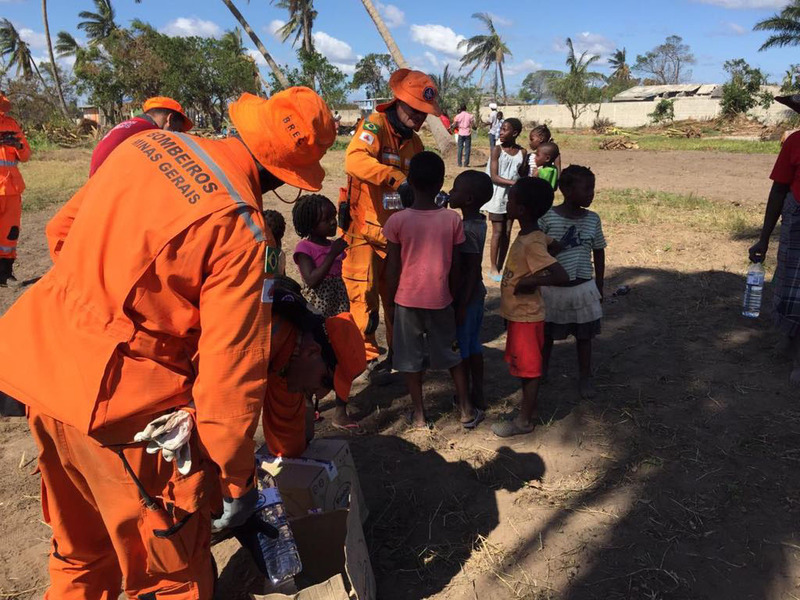 Brazilian firefighters from Minas Gerais cleaned the site of debris and assisted in setting up tents with youth volunteers and humanitarian partners. The British Red Cross set up toilets and sanitation. The Spanish Red Cross established water facilities through the WASH Cluster. An NGO, Electricians Without Borders, installed lighting. IOM supports site planning and plays a coordinating role at these sites, to confirm that partners are engaged in providing basic life saving services, including WASH, health and protection services. These services include the provision of play areas for children, and spaces for women. “IOM does not promote camps. Camps are places of last resort. During calamities, sometimes camps provide a place for affected communities to find protection and temporary assistance until they can return to their homes,” said Rafael Abis, IOM Camp Coordination and Camp Management Expert and CCCM working group coordinator. With the support the volunteers and contributions from the international community the temporary displacement site at Escola Samora Machel will provide shelter for affected families. The finished displacement site on the grounds of Escola Samora Machel. Photo: IOM/Sandra Black, 2019.